Regional Play ASA divided the country up into Regional Areas because the National Championships were getting too big, upwards of 60 teams were entering. The governing body decided that no longer can a state or metro champ go directly to the national. These state/metro champs and sometimes the runnerups along with the defending regional champs and a host team had to play in a Regional event and THAT winner went to the national championship. This would assure that the nationals would have around 34 teams. Pennsylvania was placed in Region-12 with Delaware State and Pittsburgh Metro from 1967-69. Philadelphia Metro was added and these teams competed for the coveted berth to the national championship until 1975 when the Regional format was revamped. * Golf Oasis filed a protest against San Carlos and Manager Clair Bollinger stating roster violations with the Vigilant AA team that played in the state tournament and the San Carlos (Vigilante AA) team that won the Region-12 title. Del Campo of Delaware was awarded the berth to the Nationals representing District-12 as this event coupled with the PA state championship winning team, Creighton Hose being stripped of their title for using an ineligible player put a black mark on the PA teams, so the District-12 committee selected the DE State Champ (Del Campo) to play in the national. Regional Play ASA revamped the Regional format a little. Philadelphia Metro and Delaware State were no longer in Region-12, they were moved to Region-7 with Maryland State and Metro Washington DC . West Virginia State was moved into Region-12 in place of those two associations. Virginia State, Richmond (VA) Metro, Norfolk (VA) Metro and Tidewater (VA) Metro. Maryland State and Washington DC Metro, along with Metro Philadelphia and Delaware State came over from Region-7 . West Virginia State and Pittsburgh (PA) Metro were placed in region Region-11. Regional Play ASA completely revamped the Regional format. The old 30 Region System was replaced by 15 Regions. 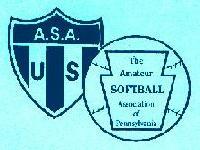 The old Region-5/6 was disbanded and Pennsylvania ASA was placed in the Central Atlantic Region (#3). It included the same associations from the old Region 5/6: Pennsylvania State, Metro Philadelphia, Maryland State, Virginia State, Metro (VA) Richmond, Metro (VA) Norfolk, Metro (VA) Tidewater, Delaware State and Metro Washington DC. Eventually, Virginia State, Metro Richmond, Metro Norfolk and Metro Tidewater were re-formed into Metro Central Virginia and Metro Piedmont Virginia. Metro (MD) Baltimore was formed and then re-absorbed back into Maryland State. Metro Washington DC and Maryland State were merged into Maryland-DC. Metro Pittsburgh became part of Region-9 until it was merged into Pennsylvania State ASA. 16 " Sports Page, Pittsburgh ? 16" Sports Page, Pittsburgh ? Open Field Bob Hoffman Products, York ? 16" I.S.I., Albion, Erie County ? Creighton Hose of Creighton had their title taken away after the fact by State Commissioner Howard Markle for use of an ineligible player. The State Title was subsequently awarded to 2nd place team Farris Construction of New Castle. Rick's Place of Chester finished third. They were subsequently awarded second place. JC Perry of Ridley beat Pyramid Temp Services of Ridley in the finals. However, it was later determined that Pyramid used an illegal player and they were stripped of second place. Perrone's Catering of Norristown, the third place team was then awarded second place. ©1998 Steve Dimitry, all rights reserved.